Back during my last trip to New York at the beginning of the year, I spent my last night there going all out at a couple of my favorite stores. I kept telling myself that I would get around to reviewing the bulk of the goodies before Christmas...but so far, I have not been doing a really good job of it. But today was just a marzipan kind of day, so into my bounteous stash I went. Happy happy, joy joy! 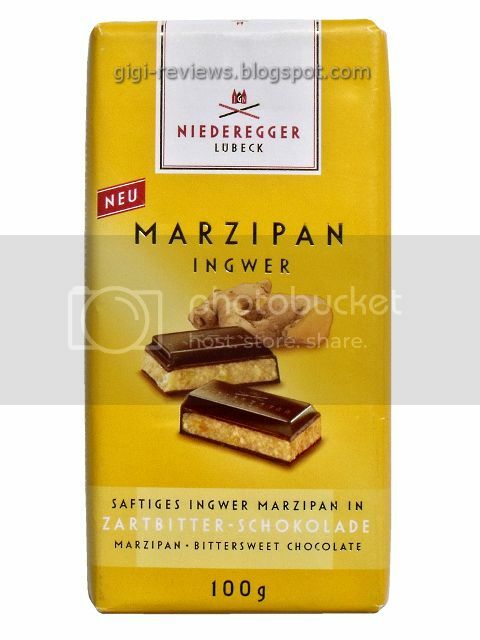 Not only did I have marzipan, but I have marzipan with ginger in it! 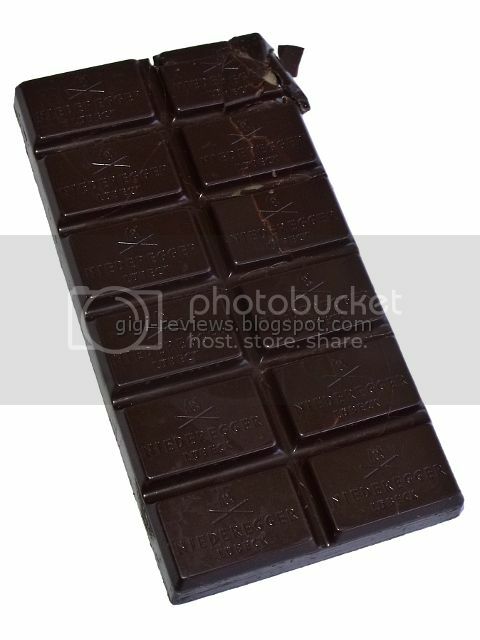 This bar consists of semi-sweet chocolate (52%) that enrobes a generous slab of marzipan which is studded with bits of ginger. First, the bar is nicely scored and molded. 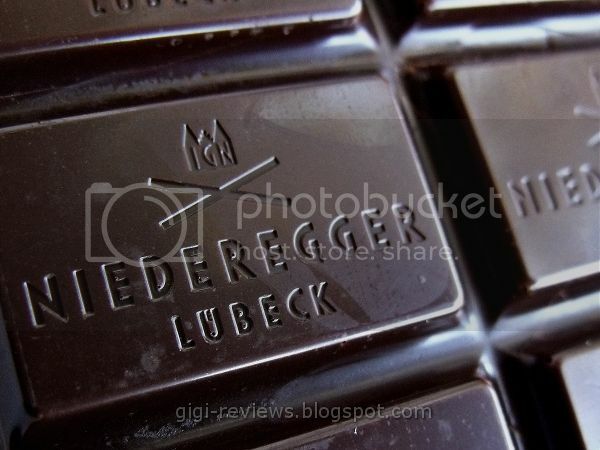 The chocolate was indeed dark-looking. 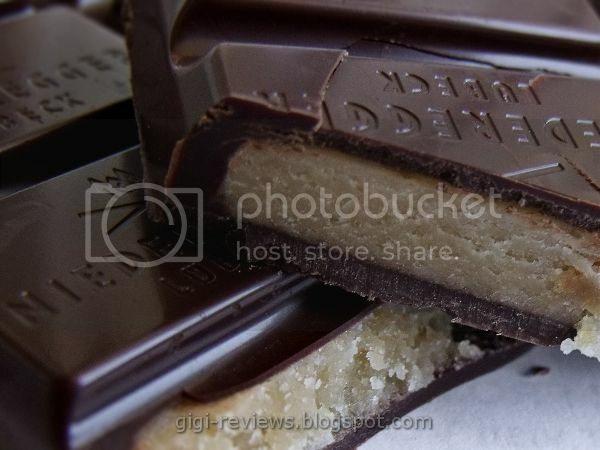 While my bar was well within its shelf life and showed no bloom (it was actually quite glossy), what annoyed me was that the chocolate shell had splintered away from the marzipan in several places. It's not an overly thick layer, but it is not exactly wafer-thin either. Maybe that's for the best, though. The chocolate, while not bad, never really rises beyond "meh." Its strongest flavor is a peppery warmth from the ginger. It's very brittle and doesn't have much of a melt. No, it's not awful, but I would never want to eat it all by itself. But forget the chocolate -- let's talk about the marzipan! Omigawd, to be able to get a loaf of this stuff! Of course there is the sweet, cherry-like almond taste you expect of marzipan. It's not too sweet, it's not bitter. The texture is moist but not sticky. Grainy but not dry. It's really the perfect marzipan. And what could possibly make such a thing even more perfect? If you guessed ginger, you would be correct. And there was just the right amount of it. You smell it and feel the heat it gives off more than you actually taste it. But it's wonderful. It's not too much and not too little, it complements the marzipan while not distracting from it. Maybe it's a good thing that the chocolate on this bar was not better, because it may have been the only thing that kept my few remaining fragments self-control in command. If you like marzipan, you simply must get your hands on this bar. Be sure to check out Jim's review. He loved it too.